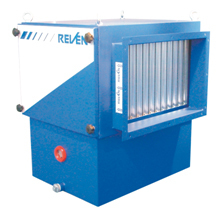 The RXZ-High-Performance separator as a duct element is intended to be installed in ventilation ducts with polluted air. Air volumes of up to 100000m³/h. The separators can not only be integrated in the ducts but also, for example in a central for the exhaust air. All devices have chamber of inspection doors which are easily accessible. For maintenance purposes the filters can be completely removed. Used as general air separator, the RXZ-High-Performance separator takes in air, both from one side and two sides , and cleans it in its basic element.